Call us for monitoring pictures and techniques to help you with assessment of establishment and success. We can help you determine if it is time to collect and move insects from your newly established insectary. We are here to help you get the most out of your investment. Information and advice are always free. Let’s talk. The beauty of biocontrol is that it is self-perpetuating. Once the insects are released, they continue to reproduce and spread on their own. Collect them yourself after establishment. Not sure which insects are already working on your weeds? Call us and/or email us with pictures and we will help with, assessing their current levels of effectiveness, and recommending easy ways for you to move these biocontrols yourself. Need help with the insects that you already have? Call us for free tips, methods, and advice on release, establishment, monitoring, and redistribution of your biocontrol insects. 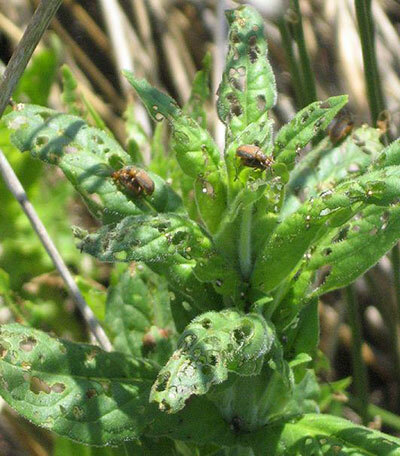 We believe a combination of all available species for each target weed is the best approach, but many of these insects have already been widely distributed and are well established. Call us to be sure you don’t already have them. No need to pay for what you already own! We will work closely with you to make the release process as efficient as possible. We will provide any consulting advice that you may require regarding the release, establishment, monitoring, and redistribution of these biocontrols as a service included with the purchase of the insects. All of the organisms we sell are regulated. Federal regulations require permits for any interstate transport and release of weed feeding organisms. State level approval is required as a prerequisite for the issuance of Federal permits. For your convenience, we secure required USDA-APHIS permits. A copy of the permit for your state will be included with each shipment. Not all vendors may provide this service. Be aware of your obligations.